Description: • Compatible with the Game Boy and Game Boy Color Systems. • Compatible with the Super Game Boy accessory. • Compatible with the Game Boy Printer accessory. 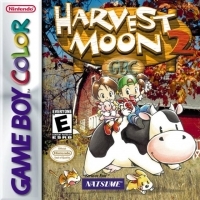 • Game Link® cable hook-up requires two Harvest Moon GBC 2 games. You found a farm at an unbelievable price-FREE! Well, there's a small catch. The honorable mayor of your local town has told you to restore the farm to its former glory within three years or he'll be forced to have the property rezoned, bulldozed and turned into a tacky theme park. There's a lot of chores to be done. You'll be growing crops, clearing land and raising animals while keeping up with the goings on in the nearby town. Nobody would have guessed that hard work could be this much fun! • Raise cows, chickens and sheep--keep them happy and they'll help make you rich! • Build a bridge, sheep pen, hothouse and more! • Special hidden arcade games include Mole Bash and Cherry Cup Horse Races! • Special Game Link® cable option allows trading between Harvest Moon 2 and Legend of the Fishing King 2! 06-07-2016 Flashback2012 Description • Compatible with the Game Boy and Game Boy Color Systems. • Compatible with the Super Game Boy accessory. • Compatible with the Game Boy Printer accessory. 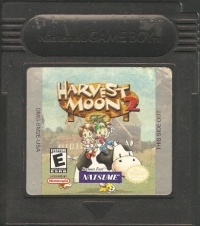 • Game Link® cable hook-up requires two Harvest Moon GBC 2 games. 06-07-2016 Flashback2012 Box Text HARVEST MOON GBC 2 It's Time to Roll Up Your Sleeves and Dig In! You found a farm at an unbelievable price-FREE! Well, there's a small catch. The honorable mayor of your local town has told you to restore the farm to its former glory within three years or he'll be forced to have the property rezoned, bulldozed and turned into a tacky theme park. There's a lot of chores to be done. You'll be growing crops, clearing land and raising animals while keeping up with the goings on in the nearby town. Nobody would have guessed that hard work could be this much fun! • Choose between playing as a boy or girl farmer • Raise cows, chickens and sheep--keep them happy and they'll help make you rich! • Build a bridge, sheep pen, hothouse and more! • Collect insects, fish and flowers for the local library reference books • Special hidden arcade games include Mole Bash and Cherry Cup Horse Races! • Special Game Link® cable option allows trading between Harvest Moon 2 and Legend of the Fishing King 2! This is a list of VGCollect users who have Harvest Moon 2 GBC in their Collection. This is a list of VGCollect users who have Harvest Moon 2 GBC in their Sell List. This is a list of VGCollect users who have Harvest Moon 2 GBC in their Wish List.